Taiwan Starflower is an adorable and useful ground cover for rich, moist soil in part shade to full sun. Intricate mid-green spreading foliage is deciduous in the coldest winters. Continuously from spring to fall star shaped white flowers appear happily over the mounding plant. 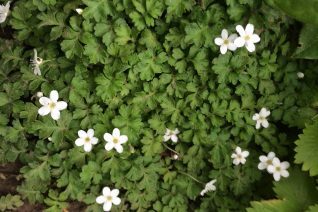 The flowers are reminiscent of the annual Bacopa. Spreads to form happy patches under established shrubs, in the front of borders. A simple and useful summer container plant as well. Avoid hard compacted soils and heavy clay. Mulch with compost annually to refreshen and bring nutrients. Regular summer water.